Announcement Welcome to KMH Collections! All items are handmade with care by me. Handcrafted items have the charm and uniqueness that handmade treasures tend to have. I take pride in each piece I create. The fine silver pieces are handcrafted from silver clay which is formed, refined and fired to produce beautiful artisan pieces that are .999 silver. If you are interested in a custom piece, please contact me. Welcome to KMH Collections! All items are handmade with care by me. Handcrafted items have the charm and uniqueness that handmade treasures tend to have. I take pride in each piece I create. The fine silver pieces are handcrafted from silver clay which is formed, refined and fired to produce beautiful artisan pieces that are .999 silver. If you are interested in a custom piece, please contact me. California Poppy - Fine Silver - "Flower That Never Wilts" - READY TO SHIP! Silver Daisy Necklace Fine Silver Handcrafted "READY TO SHIP"
Ornate Cross Fine Silver Handcrafted "READY TO SHIP"
Sand Dollar Necklace, Fine Silver - "A Dollar You Will Want to Keep Forever" Handmade - READY TO SHIP! 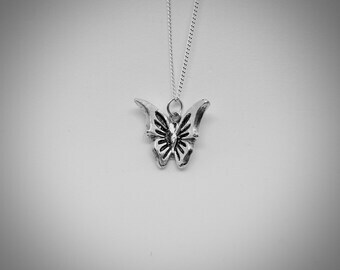 The Butterfly "A symbol of rebirth" - Fine Silver "READY TO SHIP"
Gingko Pendant, Fine Silver Jewelry, Handmade, Nature Inspired - READY TO SHIP! 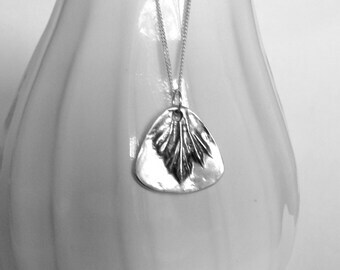 Fine Silver Leaf Pendant - READY TO SHIP! Spring Floral Tear Drop Necklace - READY TO SHIP! Round Copper Beaded Hoop Earrings - Ready to ship! Fine Silver "Wonders of Nature" Pendant - Ready to Ship! Floral Pendant Necklace Fine Silver - Ready to ship! 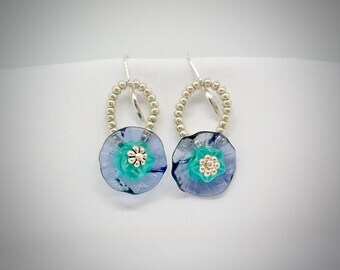 Floral Teardrop Earrings Fine Silver (.999) "READY TO SHIP"
Catch a Wave Necklace - Fine Silver - READY TO SHIP! Hibiscus Earrings - Fine Silver "READY TO SHIP"
Red and Silver Holiday Bracelet - Ready to Ship! Winter Green Earrings - Ready to ship! Love her jewelry, I have been buying her jewelry for 10 years!!!! Beautiful necklace arrived only a few short days after purchasing. Even more stunning in person! Will be making this shop a regular favorite. Unique, pretty, and like new. I believe the stones are crystal, not CZs as represented. However, I like this enough to keep it. Speedy delivery. California Poppy - Give a "flower gift that never wilts". Fine silver artisan asymmetrical heart pendant. One of the handcrafted silver clay pieces available as a custom order. Make a statement with this beautiful hibiscus necklace. Handcrafted with silver clay and a sterling attached chain. A forever sand dollar made from a mold of a real sand dollar. A must for beach lovers! Things That "Speak" To Me. It all started with a DIY on making wire angel ornaments. That led to taking a class on making bracelets. Over time, I added earrings, watches, bracelets and rings. I spend a great deal of time looking for jewelry findings that jump out at me - I like to say that they "speak" to me. 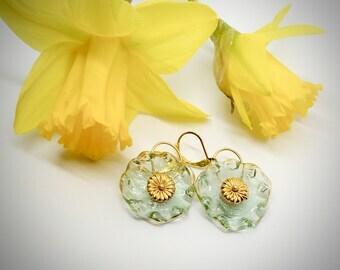 ♥ The nature of my work… my jewelry is not mass-produced. Each piece is created with love, one at a time. They have a very handcrafted artisan feel. All of my items are designed and crafted by me, in my home workspace. Each piece is made with utmost care and meant for everyday wear, gift giving, and enjoyment for years to come. Owner, Maker, Designer, Curator, Photographer, Shipping, Etc. Welcome to KMH Collections! All items are handmade. by me. I want you to be satisfied with your purchase(s). I take pride in each piece I create. Handcrafted items have the charm and uniqueness that handmade treasures tend to have. I welcome custom orders. Please convo me with your request. I take great care in making all of my handmade collections. It is important to me that you are happy with your purchase. If your item is not what you expected, contact me immediately. I want my customers to be satified with their purchases. Please contact me within 3 days if any item does not meet your expectations when you receive it. If an item is faulty, you must contact me within 3 days of receipt for a refund or exchange. Shipping will not be returned. Checkout is an easy process; either through direct checkout or using a Paypal account. As always, if you have any questions please feel free to ask. All items ship Priority Mail. Your item will ship within 1-3 business days after payment is received unless it is a custom order.